As March Madness and Easter are all the focus this weekend, three wide release movies take their shot at drawing audiences to theaters. It's a tough weekend to debut a film, but a couple of studios will be hoping that families might come to a consensus that a nice movie is a lovely way to spend some together time. The film with the best chance to make a big splash comes from Lionsgate and their favorite son, Tyler Perry. Meet the Browns is yet another movie from the mind of the famous Atlanta director/writer/producer, who has become as reliable as it gets when it comes to box office results. Over the past several years, he's been responsible in some fashion (whether as writer or director) for Diary of a Mad Black Woman, Madea's Family Reunion, Daddy's Little Girls, Why Did I Get Married?, and assorted DVD re-creations of his plays. Meet the Browns is yet another such adaptation of a play, but this time it heads for the big screen. And a key element that will figure into its success is the fact that though she's been gone for his last couple of film's, Madea (played by Tyler in drag and a fat suit), returns. And though it may be inexplicable to critics, people love her. The previous "Madea" films include Diary of a Mad Black Woman ($21.9 million opening weekend) and, obviously, Madea's Family Reunion ($30 million opening). Daddy's Little Girls and Why Did I Get Married? had respectable debuts, with first weekend totals of $13.1 million and $21.4 million, respectively. 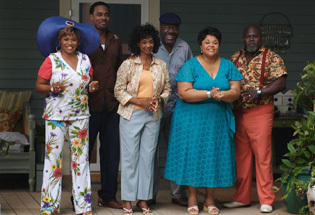 One would have to presume that Madea will create a bump for Meet the Browns, which tells the story of a single mom who takes her family to Georgia for the funeral of her father - a man she never knew. However, the film faces a challenge on Sunday as it has to contend with the Easter holiday, a day that families in its prime demographic will insist on spending together. The question is whether these families will view Meet the Browns as an acceptable way to spend some of this valuable time. My inclination is that they will to some degree, but that we won't see Madea's Family Reunion-type numbers. Instead, I believe Meet the Browns will come in with around $21 million for the weekend, which probably isn't going to be enough for a number one spot.